It’s common sense to cover your head with whatever is available when you get caught in a downpour. But depending on how far your jog to shelter is, that can get quite tiring on the arms. London product designer Shiu Yuk Yuen came up with a rather smart way to keep you safe in a downpour without being too hard on your poor little arms. 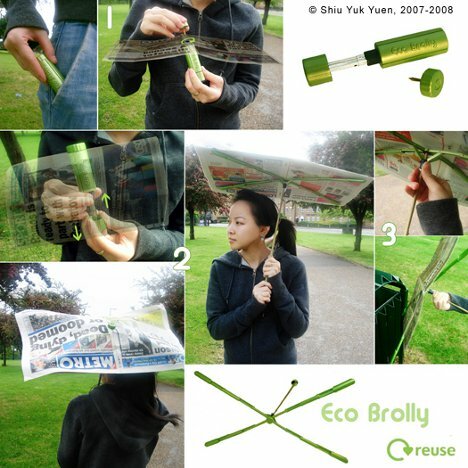 The Eco Brolly uses basically whatever you have lying around to shield you from the storm. The device consists of a pole that extends and pokes through a newspaper, plastic bag, piece of cardboard or whatever other detritus is readily available and can shield your head from a downpour. Clips can extend to secure the edges of the material so they don’t blow around. 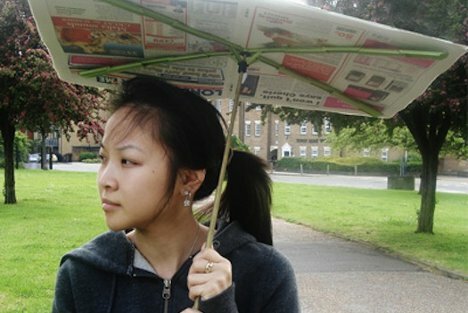 The idea is wonderfully clever, but one has to wonder just how practical it is when a cheap, pocket-sized umbrella would be just as easy to carry around.